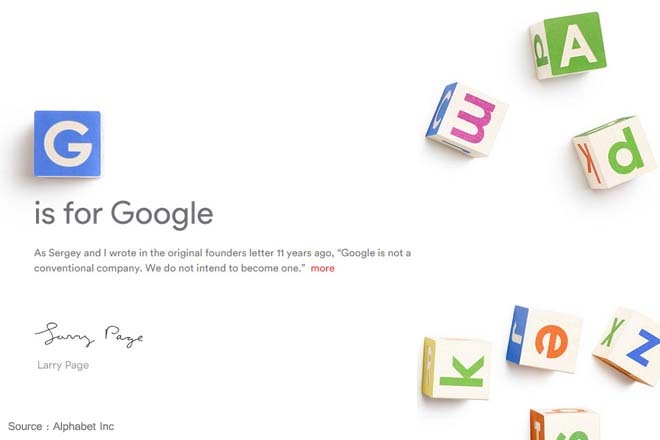 Aug 11, 2015 (LBO) – Google is to restructure their operations making it cleaner and more accountable for the company, its co-founder and CEO Larry Page said in a blog post. The company is creating a new company, called ‘Alphabet’ which is mostly a collection of companies; the largest of which is Google. “The newer Google is a bit slimmed down, with the companies that are pretty far afield of our main internet products contained in Alphabet instead,” Page said. Accordingly, Alphabet Inc. will replace Google Inc. as the publicly-traded entity and all shares of Google will automatically convert into the same number of shares of Alphabet, with all of the same rights. Google will become a wholly-owned subsidiary of Alphabet and the two classes of shares will continue to trade on Nasdaq as GOOGL and GOOG. Shares of Google were up near 7 percent on Nasdaq after the big announcement.